David Marshall Dussel, son of James B. and Hazel L. (Van Cleve) Dussel, passed away on May 11, 2015, at the age of 65. 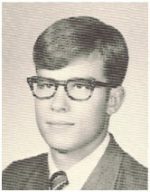 He graduated from Maumee High School in 1968. He went on to attend The Ohio State University, the University of Hawaii and received a bachelor’s degree from the University of Toledo in 1975. David led an adventurous life. He sailed the Great Lakes as a Merchant Mariner in 1972. In 1976, he volunteered for the Peace Corps and served in Togo, Africa. He went on to enlist in the USMC in 1980 and served in the Philippines. He received an honorable discharge in 1982. He is survived by his mother, Hazel; brothers, Jim and Dan (Linda); sister, Nancy (Chuck) Webster and many cousins, nieces and nephews. The family plans to have a memorial service on May 30 at 11 a.m. at Saint Timothy’s Church, 871 E. Boundary, Perrysburg, Ohio. Instead of flowers please consider a gift to UTMC in David’s name.